Focus on your feet. They’re probably your most important piece of equipment for the Camino. And, yours probably aren’t as ugly as mine. As I said before, the Camino de Santiago is mostly about your feet. Take care of them with the right shoes and socks, and they will take care of you. Blisters are inevitable. But, if you treat them properly, they’re not too bad. There are many theories about choosing socks and as many types of socks as there are theories. Here are the two that I used. I started out with WrightSock Men’s Coolmesh II Lo Single Pack Socks that are a sock within a sock. The theory of this type of sock is that the inner sock moves with your foot while the outer sock moves with the shoe. If all works as planned, the friction is between the socks rather than between foot and sock, and blisters are prevented. This sort of works. I got blisters while wearing the Wrightsocks, but who knows if they would have been worse without them? From what I know now, I would say these are more running socks than hiking socks, and I’d avoid them. This two-sock method could also be tried by actually wearing two pairs of socks, and I did see people with a very light pair of inner liner socks and a heavier pair of outers. I don’t see why this wouldn’t work, except that that’s just one more layer of heat being held into your shoe as well. And heat means sweat, and sweat increases friction, and you know the rest. Blisters. The main thing is find socks that absorb moisture and wick it away. The wicking away moisture is absolutely key. Those kind of socks are the ones that really prevent blisters. Friction prevention and heat and moisture dispersion isn’t the only function of your socks. Padding is also important. On many days you’ll be walking for hours over sharp broken rock. On many other days, you’ll spend a few hours on asphalt or hard crushed pebbles. On most days, you’ll get a little of both. That pounding bruises feet. I ended up buying a pair of Lorpen T3 Socks at a store along the way. These were trekking socks, medium weight, made in Spain, and provided the padding that the Wrightsocks were lacking. (In fairness, Wrightsocks are available in heavier varieties. I was using the Coolmesh variety, which are pretty thin.) The Lorpen socks were made of a material called Coolmax and did a great job of wicking away moisture. Those turned out to be my first socks of the day from then on. First socks of the day? Probably the best piece of advice I got, and will now pass on, is change your socks midway through your daily walk. Sit down, take off your pack. Take off your shoes and take off your socks. Take a rest while you let your feet dry out in the air. Rub them for a while and work out any knots. Re-powder or re-grease your trouble spots. Take out a fresh pair of socks (which I packed every day in the outside pocket of my pack) and put them on. It will change your whole outlook on the day when you stand up and your feet feel like you’re just starting out instead of like you’ve already been going for three hours. One more note on socks: I’ve recently bought a few pairs of Falke Men’s Cool Trekking Socks. They are expensive, but they’re, believe it or not, made for right and left feet, just like shoes. I have now worn them day after day on long walks and they are very comfortable on my usual day walking around town. If I were doing the Camino again, I’d definitely take a couple pairs. 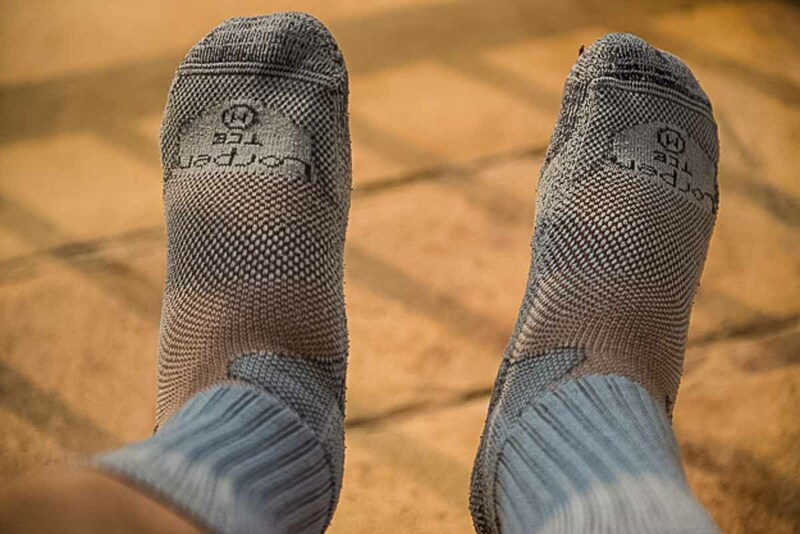 And another note: in my never ending quest for the perfect sock for hiking, I’ve recently acquired a couple pairs of Point6 Merino wool hiking socks. I haven’t had the time yet to thoroughly test them on long walks, but that comes soon as I’m about to hike a large part of the St. Olav’s pilgrimage in northern Sweden. If anything, that might be a tougher test than the Camino. I’ve used them on a couple of day hikes around the Twin Cities area so far, and the short story is I love them. (Update, October 2018. I wore these socks on several 10 kilometer hikes in the African bush on hot days. Loved them.) One thing I like about the Point6 is their fit. They seem a little tighter and molded to my foot. In addition to providing a bit more arch support, that also means they slide around in the shoe a bit better, and that’s a friction reducer. One other thing to keep in mind. My Camino experience is that thicker socks (as long as they breathe) are better than thinner ones. The Camino surface is often hard, and the padding is important. Both the Lorpen and Falke socks come in various weights. I love them all. But be sure to try on your shoes with the socks you are going to wear. If you bought your shoes for thin socks, and you end up wearing thicker socks, it’s not going to be as pleasant as you would like. One final thought: another choice is between crew socks and ankle socks. A personal preference only, but I like crew length socks better. I don’t know if the moisture wicks up the leg and out into the air, but it’s a theory anyway. It seems to me that with ankle socks, all the moisture would stay in the shoe. You can dispute if you like and you’d probably be right, but I just don’t know. This is an updated version of a post originally published in 2013. I recall walking to Walsingham in my youth and benefitting from Dr. Maarten’s shoes. Some people in the group dipped their feet in methylated spirit, which I gather hardened the skin, but must have been mighty itchy. Oliver, I should think Docs are pretty heavy for extended hiking, albeit comfortable and durable. Did you have to scrabble over much broken rock? I used the Wright Socks before. They are awesome! They are so comfortable. I had some low quality socks in the past, where the material got caught in the shoe, and caused blisters. I am a pretty active person, so needless to say, this way a problem. I wholeheartedly recommend Wright Socks to anybody who wants to keep their feet comfortable, warm and dry at the same time. I do like the Wright socks, too. But, like I said, the pair within a pair option didn’t work well for long distance walking. Blisters. A single sock with lots of powder worked better for me. I’ve always worn 1000 Mile Socks and never had any problem. They’re double and blisters just are not part of the equation. No trouble up and down mountains (Merrell Moab GTX shoes). Tried the Santiago Road once, After a few miles found it very boring, so headed into the Basque mountains to some real trails and thoroughly enjoyed them. I’m going to have to look into those. Just done some hiking in Patagonia with Lorpen socks and like them a lot. And yes, the Camino does get awful tedious at times. I think the next time, we’re taking the Northern Route. Much more strenuous, I hear. But also more beautiful. The north has some spectacular routes. Not the Camino de Santiago, forget that, go south of the Del Norte and head for Reinosa. From there you have a string of national parks (Parque Nacional de Los Picos de Europe, Parque Natual Ponga etc.) which go west, just south of Oviedo. Tappon did some of that when he got tired of the CDS. I haven’t been up to that part of the country since the early 70’s when it was just a kind of wilderness area with the big Spanish Brown bears (now nearly extinct), other wildlife and pretty big mountains. Bushwhack at your own risk (Spanish cops aren’t too keen on that). If you do decide to go through the Basque Mountains, some parts are almost rain forest with very dense undergrowth and you WILL need a machete (buy one in Santander). The water from the tiny streams, deep in the mountains, is drinkable and delicious (not the bigger rivers though). A lot of unmarked trails, so your navigation’ll have to be good.